Bank holiday weekends have a tendency to involve beer. I’m not a huge beer fan, I can take it or leave it. It’s a change from a gin and tonic in the pub but it’s a bit bloating isn’t it really. So I wouldn’t mind giving it up at all, I wouldn’t even notice. Graham on the other hand, he would notice. So I’ll be really interested to see how the next gluten free month goes. Driving back from friends he asks if its normal to always have red hands the day after drinking, ‘not really dear’. I won’t bore you with the full conversation and self diagnosis but we decided he might be allergic to alcohol. When we get home, he googles alcohol allergy and notes that he has many of the signs of an intolerance to gluten. He’s going to get this checked out at the doctors – I’m not keen on just self diagnosing – and I’m not one for jumping on the food intolerance bandwagon. Everyone has one these days don’t they! I am however, happy to help him trial a gluten free diet for a month to see if there is a difference. It’s best to test these things isn’t it, so long as you keep a balanced diet, I’ve heard people say they feel a million times better eating less gluten. Let’s see how he gets on not snacking on cheese sandwiches when he gets in from work, toast in the mornings, pasta dinners, beer! So, doing the supermarket run today, I get ‘I’m starving, its 11:30 and I haven’t eaten anything at all!’ He hadn’t had breakfast because he can’t eat cereal or bread, his face was a little panicked at the thought of having to be a little imaginative about what he eats from now on. Lucky for him, I kicked him off nicely on day one of the new diet. Super delicious, super easy and definitely a winning cooked breakfast. He was happy anyway. I had a big box of mushrooms that were at that point where you use em or lose em. 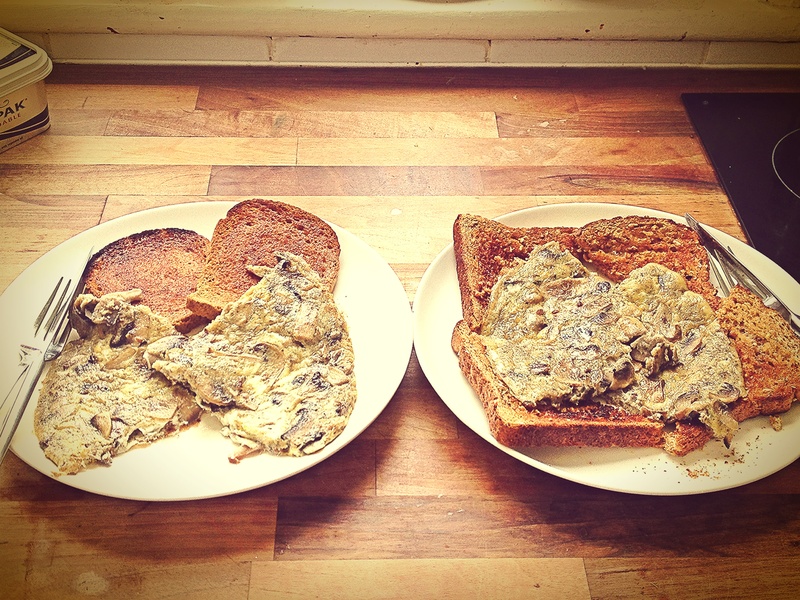 I hate waste, so mushroom omelette it was. It’s a pretty straight forward breakfast so I feel pretty patronising giving a recipe, but here’s one anyway to use or ignore as you please. Gluten free bread for his toast and lovely seedy wholegrain for me! Get a large frying pan to a medium heat and throw in good old glug of olive oil. 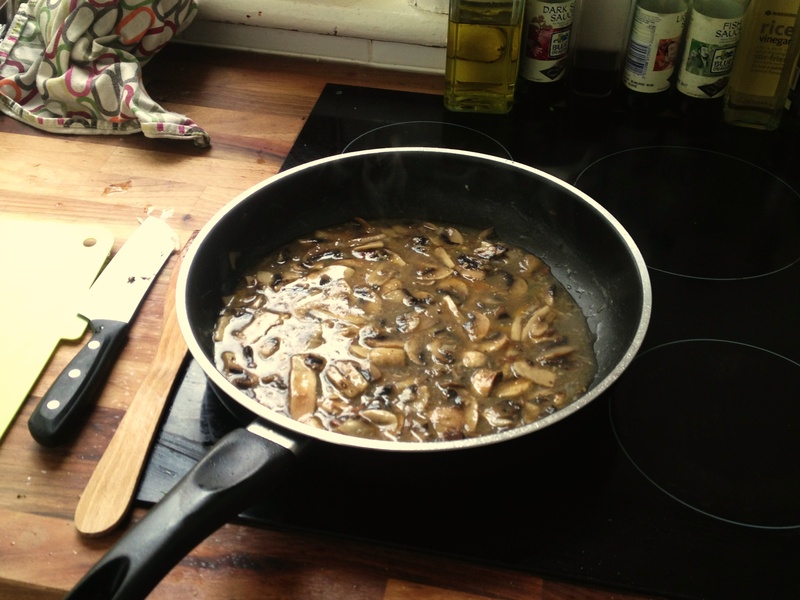 When the oil is hot, in go your mushrooms, they shouldn’t brown or cook too quickly, just shrink and soften nicely. 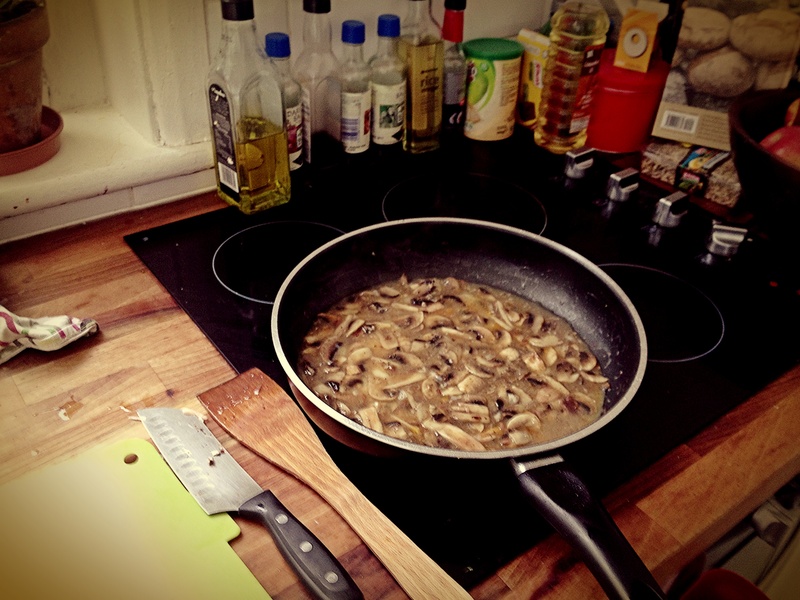 As they cook, lay your anchovies around the pan to melt and disappear pour in the oil from the tin for good measure. Turn down the heat to the second lowest heat, eggs taste better cooked longer and lower I find. Eggs cooked on a higher heat get that crispy edge and really dry out, they loose that eggy flavour. Crack your eggs straight in the pan when the heat is low as you need it, break them up and stir up your omelette quickly. Then leave to cook slowly, really slowly, you have to be a little more patient here than you’d imagine with an omelette. It’s tempting to get your spatula in there and speed things up with a bit of mixing, don’t. Just let it cook. When it looks like its nearly done, get your toast on, gluten free or not. If by the time your toast is done, you still have a few dribbles of raw egg that you don’t like the look of, you can give the pan a very quick blast under the grill, but not too long. A few runny bits in an omelette is no bad thing in my books, but today I grilled them off. This entry was posted in Uncategorized and tagged anchovy, beer, Bread, egg, Family, food, Gluten, gluten free bread, gluten free diet, Olive oil, omelette on April 1, 2013 by sheeatsyummyfood. Thanks! It was. Sometimes the simple dishes are the best. She's eaten something yummy! She Eats Ymmy Food has updated her blog. Take a look.